Common sunflower has a larger bloom and alternate leaves. Pale-leaved sunflower has opposite leaves. Leafcup leaves are maple-like; pale-leaved sunflower leaves are lanceolate. Small wood sunflower has smaller blooms. 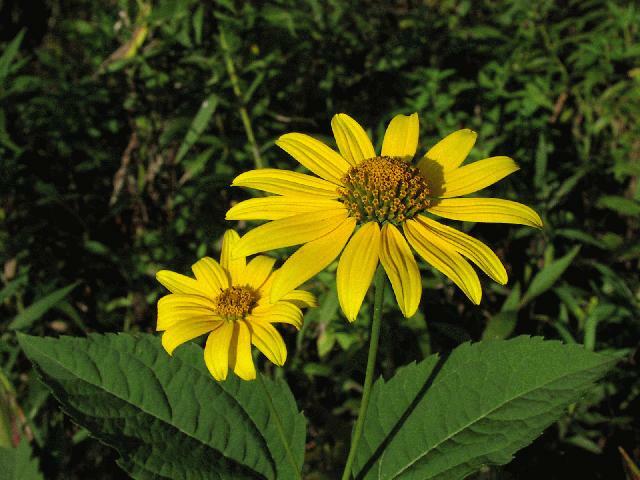 Pale-leaved sunflower leaves are lanceolate; tall coneflower leaves are deeply lobed. Leaved of whorled rosinweed grow in whorls of three. Leaves of woodland sunflower have very short stems (less than 1/4 inch); pale-leaved sunflower leaves have slightly longer, and the leaves have more conspicuous veins.